Cost to install a rainwater collection system varies greatly by region (and even by zip code). Get free estimates from landscapers in your city. Cost to install a rainwater collection system varies greatly by region (and even by zip code). Get free estimates from landscapers in your city. The average cost of installing a rainwater collection system is $2,500. How much does it cost to install a rainwater collection system? A rainwater collection system is a way to capture rainwater to save and distribute later. They can be simple or complex, but either way are a great way to save on your water bill and conserve water over the long term. If you live in an area that experiences drought or if you find yourself frequently watering your lawn or garden, having a rainwater storage and distribution system can help offset relying on the municipal water supply. The true cost of any home improvement project will vary based on where you live, but an average 5,000-gallon “dry” tank system will cost about $2,500, including installation. There are many things to consider before installing a rainwater collection system. Water is free to collect. Rainwater does not contain chemicals or additives that municipal supplies often have. Collecting rainwater reduces the potential for local flooding. Collecting rainwater saves on utility bills. Rainwater is better for landscaping than municipal water. Storage tanks take up lawn space. Construction and installation are unregulated. Collected rainwater can be used for watering lawns and landscaping, and it can also be treated and used to supplement your municipal supply by using it for washing machines and other in-home uses. In some cases, where the law allows, you can even treat rainwater and use it for drinking, but many areas do not allow this practice. The way a rainwater collection system works is by consolidating rainwater from rooftops. Rainwater systems redirect water from gutters and downspouts and hold water in a storage tank. The system has some form of distribution, which can be as simple as a spigot and hose and as elaborate as a full irrigation system 1 that’s integrated into the municipal supply. An average household rooftop is about 2,000 sq. ft. Annual rainfall varies dramatically based on where you live in the country, but you can expect to collect about 0.62 gallons of rainwater per square foot of rooftop per inch of rainwater. Look up your area’s average annual rainfall to determine how much rain you might collect during the course of the year. There are two different styles of rainwater collection: above ground and in-ground. 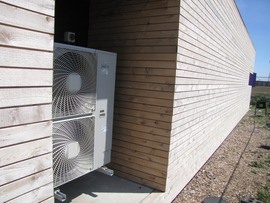 Above ground systems are considerably easier to install than in-ground systems and cost less in general. Their base components are the same, in that they both have a storage tank and a distribution method, but the tank for the in-ground system is dug into the ground. This may be more aesthetically appealing, as the system components are hidden from sight; however, this will be more expensive than an above-ground system. In terms of performance, both types of systems are comparable. In-ground systems must be located at least 10 feet away from any watertight sewer line 2 and 50 feet away from any non-watertight sewer line to avoid contamination. If you can’t work within those limits, you may have to stick with an above-ground system. Costs related to in-ground systems will vary considerably based on the size of your tank and intricacy of your system. In addition, if you have gas or water lines close to the house, that can impact both the cost and the design and location of your system. Breaking down a rainwater system into its basic components, you need a collection method, storage, treatment, and distribution. Here is a list of the different components for rainwater systems. Not all components are required. Gutter outlets guide water from the gutters into the storage tank. Rain barrel: this is the simplest method for collecting rainwater. A rain barrel connects to a gutter downspout and usually has a cover and a spigot at the base for distribution. Raising the barrel above ground level will allow gravity to push water out. Rain barrels cost about $100. ‘Dry’ system: a ‘dry’ system is essentially a larger version of a rain barrel. A dry system uses a large storage tank that is placed close to the house for water to flow from the gutter pipes directly into the storage tank. This is called a dry system because the collection pipe is “dry” in between rainfalls, as the water flows straight into the tank. The largest portion of the cost of a dry system is the storage tank, which varies based on capacity and storage material. A 5,000-gallon polyethylene tank costs about $2,100. ‘Wet’ system: a wet system is much more complex than a dry system. With this type of system, the pipes are located underground, and all gutters eventually feed into this system. The pipes fill with water until there is enough to spill over into the storage tank. Due to the need for underground piping, it costs significantly more than a dry system or rain barrel. Costs vary based on the amount of pipes that need to be laid, but expect to pay landscapers $45-$75 per hour for labor. For a 5,000-gallon ‘wet’ tank with a sprinkler system, you’ll pay $2,500-$4,500 for the irrigation and sprinkler installation (24-32 labor hours), $4,000 for a steel storage tank, $2,500-$3,000 for a water treatment system, and $440-$760 for three hours of excavator rental to dig the hole for the tank, which includes an operator. This comes to about $12,000. 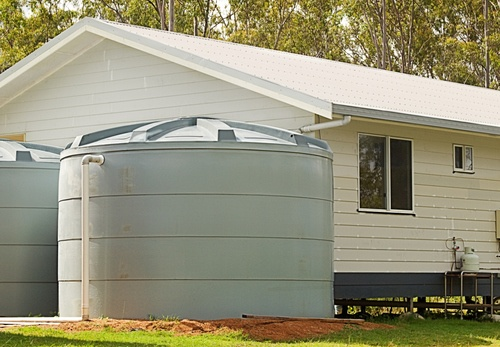 Before installing a rainwater collection system, you’ll need to consider what size storage tank you will need and the amount of space required for it. Your tank size needs will vary based on how much rainfall you have in your area and how much space you have on your land. A 5,000-gallon polyethylene tank will cost about $2,100. A dry system will need to be placed close to the house, but a wet system can be installed farther away from the building. Rain barrels will need to be directly underneath a downspout. Screens aren’t required, but they do prevent debris and leaves from getting into your rainwater. Filters are’nt required if you’re just using your system for irrigation, but are necessary if you plan on using rainwater for household use. Irrigation systems will add significantly to your costs. The location and elevation of the irrigation area relative to the rainwater collection system will impact the cost, but on average, an irrigation/sprinkler system will cost $2,500-$3,500. The tank seller may provide installation services, but certain landscapers may also be able to install these collection systems. 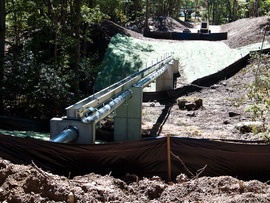 An average project involves preparing the tank area, connecting the tank to the downspout(s), and connecting the tank to a pump and any pipes or exit points. Landscapers charge on average $45-$75 per hour. Installation time will vary based on the size and scope of your project. A sprinkler system and irrigation for a wet system will take 24-36 labor hours and will cost about $2,000-$3,400 just for labor. A wet system would also need excavation to bury the storage tank. You would need to pay for excavation equipment rental and an operator, and the project would probably take about 3 hours and cost $440-$760. Rainwater collection systems do require some regular maintenance. Gutters and filters need to be cleaned, and all components should be inspected to ensure that all parts are in proper working order. This is something you can do yourself or have an experienced landscaper come out and take care of. Landscapers will charge by the hour ($45-$75), and you should have your system checked every season. Visually inspect your system after any rain to ensure that filters are not clogged. 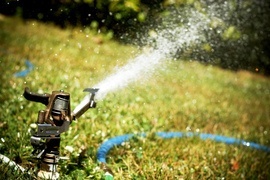 You may not want to deal with the hassle of watering the lawn yourself, which is why you may want to consider a sprinkler system. Adding a sprinkler system will add to your system costs. A standard, professionally installed sprinkler system for an 8,000 sq. ft. lawn averages $2,500-$3,500. If you intend to connect your rainwater harvesting system to the public water supply, check your local regulations. Not all municipalities allow for this, and those that do require special permits and the consent of the operator of the local water supply system. Consult your local government before installing your rain harvesting system. Rainwater harvesting systems are not federally regulated, but there may be local laws that regulate rainwater capture. While most areas allow you to freely harvest rainwater, not all places will allow you to use rainwater as potable water. Check your local ordinances before installing your system. Depending on where you live, there may be tax incentives for installing a water collection system. Tax credits, deductions, or exemptions may be available at the state, or even city, level. Check your local guidelines or contact your town’s municipal offices for details. Harvesting rainwater isn’t the only way to save water. Here are a few other things you can do as well: take shorter showers, install low-flow toilets and showerheads, wash full loads of clothes, water your lawn in the early morning or evening, don’t overwater your plants, and use drip irrigation systems. Is it against the law to collect rainwater? It depends on where you live. In most states, it’s legal to collect your own rainwater for watering lawns and gardens, but it may be against the law to collect rainwater for drinking. Check your local ordinances. How do rainwater collection systems work? There are different types of systems, but typically there is a rainwater capture mechanism, a container to hold the water, and some way to distribute the water. The simplest method is a rain barrel with a spigot and hose. Unfiltered and untreated rainwater often contains contaminants that can be harmful if ingested. You would need a properly maintained, elaborate water treatment system to safely drink rainwater, and this is not legal in many areas. How much does it cost to install a rainwater collection system in my city? Cost to install a rainwater collection system varies greatly by region (and even by zip code). To get free estimates from local contractors, please indicate yours.